Ukraine as a sovereign state will decide on its domestic and foreign policies independently, Prime Minister Yulia Tymoshenko has said. 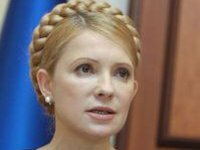 "Though, according to the Constitution, the foreign policies are in the president's competence, I cannot keep silence on the latest developments in Ukrainian-Russian relations… Ukraine will decide on its domestic, foreign policies, including humanitarian issues, independently," Tymoshenko said in a statement issued on Friday. At the same time, the premier said that she has been always building and intends to build " equal relations with Russia based on national interests, mutual benefit and respect for sovereignty and territorial integrity." "Ukraine's realization of its sovereign rights, forming a modern political nation, cannot be considered as a policy aimed against anyone," Tymoshenko said.